Glioblastoma is the most common form of brain cancer and is frequently lethal; most patients die within two years of diagnosis. Just like normal, healthy tissues, the growth and development of glioblastomas is driven by stem cells that proliferate and give rise to other tumor cells. Glioblastoma stem cells are hard to kill because they can avoid the body's immune system and are resistant to chemotherapy and radiation. But killing these cells is vital to prevent new tumors from recurring after the original tumor has been surgically removed. "It is so frustrating to treat a patient as aggressively as we know how, only to see his or her tumor recur a few months later. We wondered whether nature could provide a weapon to target the cells most likely responsible for this return," says Milan Chheda from Washington University School of Medicine in St. Louis. One approach to killing cancer stem cells involves using viruses that specifically target tumor cells. 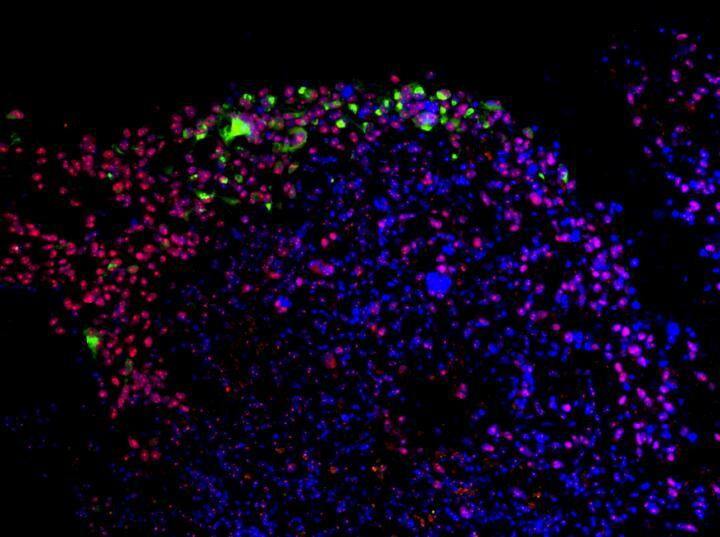 Zika virus appears to disrupt fetal brain development by preferentially targeting neural stem and progenitor cells. The virus' effects on adult brains–which contain fewer active stem cells that developing fetal brains–are generally much less severe. "We hypothesized that the preference of Zika virus for neural precursor cells could be leveraged against glioblastoma stem cells," says Michael Diamond, also from Washington University School of Medicine in St. Louis, who co-directed the study with Milan Chheda and with Jeremy Rich, from the University of California, San Diego and the Cleveland Clinic Lerner Research Institute. The researchers found that Zika virus preferentially infected and killed patient-derived glioblastoma stem cells compared with other glioblastoma cell types or normal neural cells. When mice with aggressive glioma were injected with a mouse-adapted strain of Zika virus, the virus slowed tumor growth and significantly extended the animals' lifespan. The researchers then tested a mutant strain of Zika that is less virulent than naturally occurring strains of the virus. This "attenuated" strain, which is more sensitive to the body's immune response, was still able to specifically target and kill glioblastoma stem cells and was even more effective when combined with a chemotherapy drug, temozolomide, that usually has little effect on these cells. "This effort represents the creative synthesis of three research groups with complementary expertise to attack a deadly cancer by harnessing the cause of another disease," says Jeremy Rich. "Adults with Zika may suffer less damage from their infection, suggesting that this approach could be used with acceptable toxicity." "Our study is a first step towards the development of safe and effective strains of Zika virus that could become important tools in neuro-oncology and the treatment of glioblastoma," says Diamond. "However, public health concerns will need to be addressed through pre-clinical testing and evaluations of the strains' ability to disseminate or revert to more virulent forms." About The Journal of Experimental Medicine The Journal of Experimental Medicine (JEM) features peer-reviewed research on immunology, cancer biology, stem cell biology, microbial pathogenesis, vascular biology, and neurobiology. All editorial decisions are made by research-active scientists in conjunction with in-house scientific editors. JEM provides free online access to many article types from the date of publication and to all archival content. Established in 1896, JEM is published by The Rockefeller University Press. For more information, visit jem.org.